At least 60 percent of China’s underground water resources have “very poor” or “relatively poor” quality, which means these water can’t be used for drinking directly, says a new report, showing a deep environmental crisis in the country. China’s Ministry of Land and Resources has been monitoring at least 4,778 areas in 203 Chinese cities in 2013, the official Xinhua news agency said. According an annual report unveiled by the ministry, in at least 43.9 percent of the monitored sites the underground water was ranked as “relatively poor” and in 15.7 percent of cases as “very poor.” This means that about 59.6 percent of underground water can’t be used directly for drinking. The recent results show a decrease in the amount of drinkable underground water in China by 2 percent compared to 57.4 percent in 2012. If the quality of water is considered "poor," it can’t be used at all as a source for drinking water, say China's underground water standards, while water of “relatively poor" quality may be used for drinking only after special treatment. According to the report, water quality became worse in 754 areas monitored by the ministry and improved only in 647 sites. Deterioration of drinking water quality is still one of the country’s major problems. The pollution is caused by an increasing population and rapid economic growth as well as lax environmental oversight. 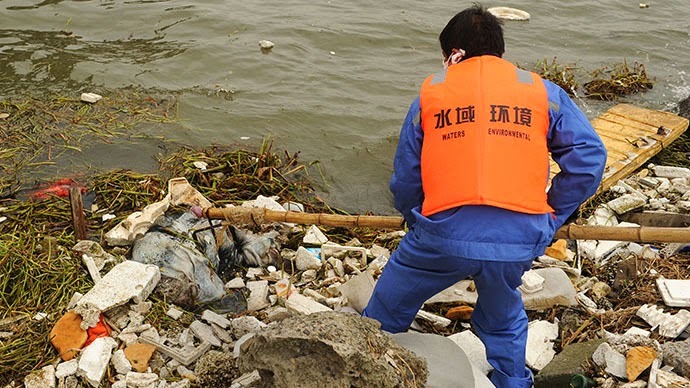 However, on 22nd April 2014, the chairman of the Chinese unit of French utility Veolia Environment "bowed and expressed his apology" to the public after the accident. Meanwhile, China is not only affected by water pollution. According to a report released earlier in April on the website of the Ministry of Environmental Protection, one-fifth of Chinese farmland is polluted as a result of the country’s dramatic industrialization, overuse of farm chemicals and minimal environmental protection. The report was originally a state secret and names heavy metals such as arsenic and cadmium as main pollutants. According to the country’s vice-minister of the Chinese Environmental Protection Ministry, Wu Xiaoqing, 71 out of 74 cities monitored in China over 2013 did not meet state environmental standards with various degrees of problems. The Chinese government has been trying to curb its pollution problems ever since. The authorities have introduced numerous policies to try to clean up the environment, including investing in new non-polluting projects and giving courts the power to enforce stiff penalties. In December, the Chinese government used ‘cloud seeding’ method- artificial rain - to disperse the smog that affected the majority of the cities in the country. However, the enforcement is patchy; particularly at the local level, where authorities rely on taxes from polluting industries. SEAWAPA will be the cheap and only long term solution to the crisis unless the Chinese government, part of the British Empire is executing Agenda 21 to reduce their own population quickly.